During the shift to more adaptive, agile ways of working (and particularly as agile scales beyond the tech team) questions often arise around governance and control. Concerns can be raised about alignment, control of costs and direction. People often feel uncomfortable moving away from the apparent comfort of a detailed, forecast end point, and leaders shy away from the apparent inherent risks. The irony being of-course, that many traditional approaches are built on false certainty anyway. Plans and forecasts become outdated as soon as they’re inked. Predicted outcomes quickly become obsolete and in need of updating. 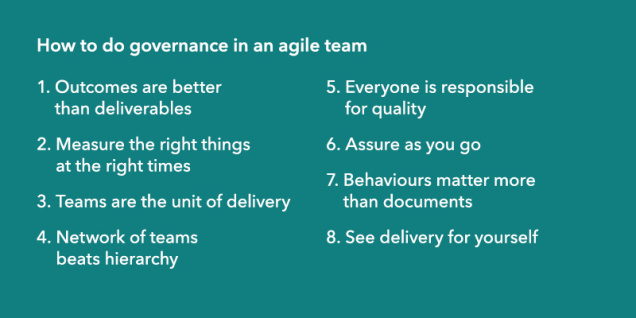 So I really liked what the Co-Op digital team had to say about their approach to agile governance. If by governance we essentially mean doing the right things in the right way, then agile, iterative working actually mitigates risk rather than compounds it. The ability to be more adaptive means that we never get too far before we can switch course. The practice of working closely with end-user input and feedback. Continuous testing and delivery. Outcomes are better than deliverables: the importance of orienting the team around what the product or service actually does, aligning that with the wider vision, easily measurable mid or long-term goals, space to learn what works rather than specifying the solution upfront. Much to like about this. Yet the wider point here, and one that we bring to life in the book, is that this again speaks to principles, behaviours, and approaches that have far wider benefit than just the tech team. As Jamie says in his post agile is more of a mindset than a set of defined processes. It’s about being agile, not just doing agile. For more like this, and for exclusive content related to the upcoming book on Building the Agile Business, you can sign up here.